Last year we did go on about Hudson Valley Seeds. Not only did their seeds grow strong and true for us here in Chicago, but the artist-produced packaging seems a perfect merging of beautiful regional vegetables and regional artists too. 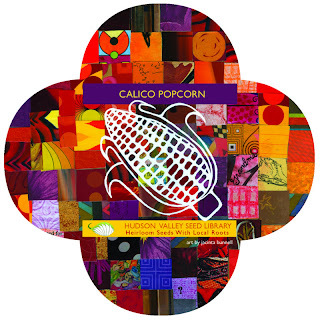 Civil Eats just put up a nice interview with the proprietors, who say that choosing "artwork over photographs for our seeds packs...communicates what's important about seeds--that they come with stories." Do they ever. Bruce started our greens seeds from Hudson Valley indoors early in 2010 and we planted out on St Patrick's Day. We particularly enjoyed the braising greens. Picked in their infancy, they provided endless salads (never did get around to braising them). ...and also the deep green tatsoi, shown here thriving on Bruce's roof. Somehow I missed this October NYT story on Hudson Valley Seeds. 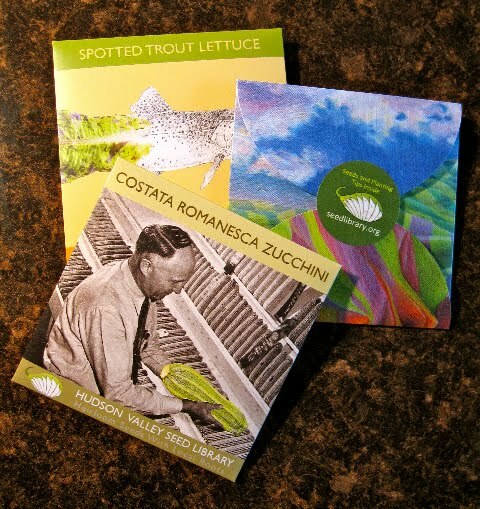 On this wintry day you might enjoy thinking about the seed collection and packaging taking place there. We'll be renewing our membership this year. 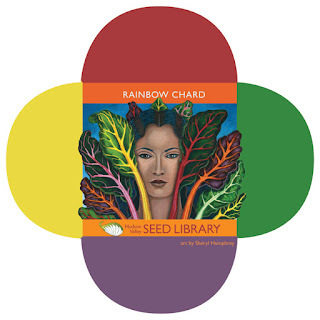 It's almost too good to be true: for $20, choose ten seed packs from about 130 heirloom varieties. We let our tatsoi go to seed this summer, harvested it, and replanted this fall. It's thriving right now upstairs in our unheated (but not freezing) second floor. Art has since hung lights over this SIP line-up, and we'll return the lights to Bruce in a scant couple months so he can start the cycle of seed-starting all over again, getting our spring crop up to size for planting out in March. For indoor growing this winter, we're using these commercially available SIPs, because the slow-growing indoor crop requires less potting medium and water than our two-bucket SIPs. HVS is here. Click in the left-hand column to review seed types.